In construction, falls are the leading cause of fatal accidents in the United States. The risks for owner liability and potential litigation during construction projects can be mitigated through proper implementation of a certified personal fall arrest or fall protection system. 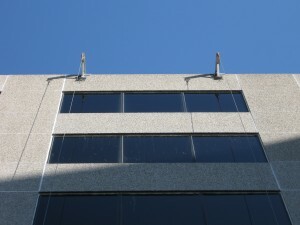 For most repair and restoration projects, and even rooftop equipment maintenance work, high-rise facilities must adhere to a number of standards when exterior work of any kind is performed- ranging from window cleaning, to masonry re-pointing, to the servicing of HVAC equipment. Before exterior work is permitted, owners should ensure that fall protection systems are in place to meet current OSHA, ANSI, and other applicable local regulations. Fall protection systems can include a wide range of structural, load-certified tieback anchorage points, which permit workers to access the building exterior via swing-stages, boatswain’s chairs, and other personnel access systems. Roof-mounted pedestals, wall-mounted anchors, davit arms and sockets, cable systems, trolley systems, and rooftop structural beams and columns, should be load tested per OSHA standards and certified by a licensed structural engineer. 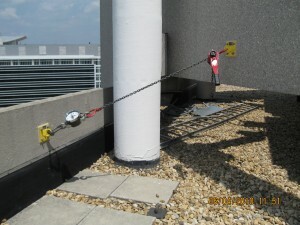 Workers then use lanyards and harnesses to tie-off to designated, certified fall protection anchorage points. 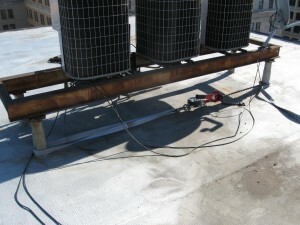 FEA can evaluate whether existing fall protection system components provide adequate worker access to the facility exterior, ensure compliance with applicable standards, and perform load-testing of the existing system, as well as provide documented certification of the existing anchorages for worker use. FEA can provide an initial assessment if no fall protection system or structural anchorage points are currently in place, and make recommendations for a new fall protection system, including design layouts for a new compliant system with tieback anchorages, construction administration services for the duration of the system installation, load testing of the installed system, stamped drawings detailing use of the system, and annual re-certification to ensure continuous use of the system components.